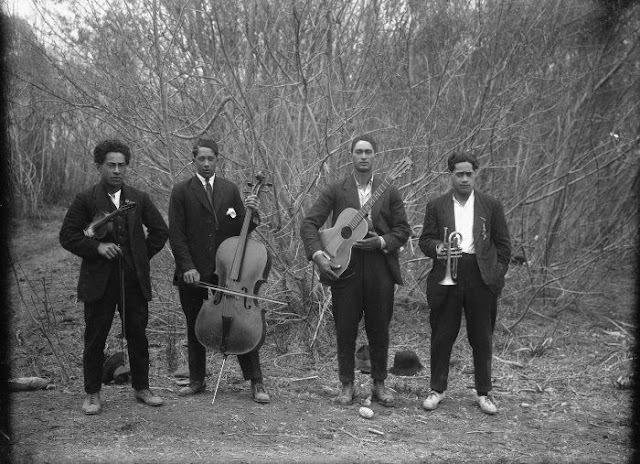 I came across this rather striking image of a group of unidentified Māori musicians in the most recent Turnbull Library Record. According to the Turnbull Library's accession information not only are the musicians unidentified, but so is the photographer, while the date is also unknown. My best guess for the latter would be late 1940s/early 1950s. There must be people who recognise the musicians, perhaps their descendants. It would be great to learn their identities.